We open, use and close lot of applications while working on Windows 7 computer. One can easily save time and do things quickly by launching applications with keyboard shortcut hotkeys instead of manual clicking. 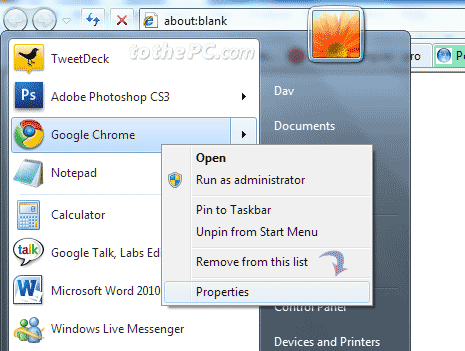 On Windows 7, you can create and assign keyboard shortcuts to application without need to use any external software. 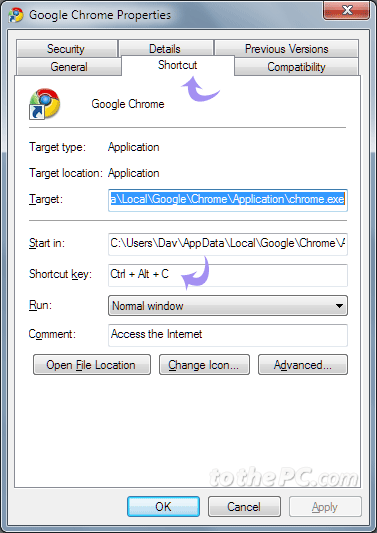 Following is quick procedure for assigning shortcuts to application programs. 1. Click on Start and go to All Programs. 2. Right click on the application program to which you want to assign the keyboard shortcut and then click Properties option. 3. Application properties pop up windows will open. Click on Shortcut tab and then type combination of keyboard shortcut keys that you want to use to launch the application. For example: press C key for Ctrl + Alt + C keyboard shortcut listing for specific application. Also make sure the combination that you have entered is available and not assigned to any other application in Windows. 4. Click on Apply and close the window. From now on, you can easily launch programs using quick keyboard hotkeys. You can also use free software assign keyboard shortcuts to application programs. Windows Vista Successor Windows7 revealed, really?